Ole Gunnar Solskjaer faces a delicate balancing act for Manchester United’s meeting with West Ham United in the Premier League on Saturday. Three points are an absolute necessity, with the Norwegian declaring the club required 15 points from the remaining 18 available. On top of that, there remains the small matter of visiting the Nou Camp on Tuesday. Solskjaer, therefore, needs to find the right balance between resting certain players and fielding a team capable of playing with the rhythm necessary to dismantle West Ham. Here is a guess at what the starting XI may look like. Marcus Rashford, first of all, must be preserved for the Nou Camp cauldron. In the first leg he looked tired, fazed, unsure of himself. The kid has relentlessly played more or less every minute under Solskjaer and it is beginning to taking a toll. Romelu Lukaku, who loves scoring against West Ham, ought to take the No.9 spot with Anthony Martial and Jesse Lingard – neither of whom played on Wednesday – on either side, to get some rhythm for Barcelona. Further back, Solskjaer’s hands are tied when it comes to the midfield, with both Ander Herrera and Nemanja Matic sidelined through injury. Suspensions for Luke Shaw and Ashley Young paves the way for Matteo Darmian to get a rare start at left-back. It is no by means Solskjaer’s strongest, most fluid outfit at a time when the team is struggling. 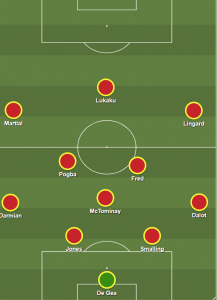 The senior players in the XI – such as Paul Pogba, Lukaku, Lingard, Smalling – have to take responsibility in a way which they failed to do at Wolves.